Port proximity means ample options for distribution centers. Steve Stacey heads the McLane Pennsylvania operation near Scranton. Consumer goods distributor McLane selected an eastern Pennsylvania location to serve its customers in the region. cLane Company, one of the largest U.S.-based wholesale distributors of groceries and consumer goods, needed a new distribution center in the Northeast to accommodate its growing business. The company, currently a subsidiary of Berkshire Hathaway and formerly owned by Wal-Mart, serves convenience stores and mass merchandisers and has a customer list of more than 50,000. McLane's search for a new facility quickly brought it to eastern Pennsylvania, a region equidistant to its two overburdened distribution centers. McLane chose Jessup, Pa., a suburb of Scranton, as the location for its new 410,000-sq.-ft. (38,000-sq.-m.) distribution center that will serve Eastern Pennsylvania, New Jersey and parts of Delaware. The greenfield facility is due to open in the Valley View Business Park in June. "We decided we needed a location in the general area of Eastern Pennsylvania because our two distribution centers in Baldwinsville, N.Y., and Frederick, Va., which were covering these areas, were reaching their capacities in storage and throughput," says Steve Stacey, head of the McClane Pennsylvania Division. 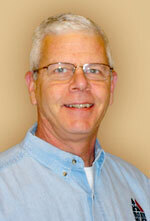 "So, we needed the site to relieve some of the pressure from those facilities. Eastern Pennsylvania was our regional choice because it allows us to reduce travel time." 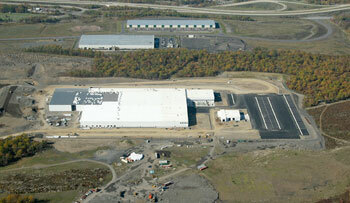 Many of the distribution center projects announced for New York State during 2007 also involved food processing or food services. These included expansions by Goya Foods in Angola, C&S Grocers in Chester, N.Y., and Golub Corp. in Rotterdam. The new facility in Jessup gives McLane a total of 20 grocery distribution centers. It also operates 20 food service distribution centers. Stacey says McLane schedules a phased approach to opening its new facilities, with some customers linking to the new distribution center in June and others to follow later in the year. Northeastern Pennsylvania, with its ready-made access to the entire northeastern U.S., is a popular site for distribution operations, and it provides a good pool of skilled workers, Stacey says. When the Jessup facility is fully ramped, it will employ 250, plus 100 drivers. "The labor market is ideal for our industry because Jessup and Scranton have historically been a hub for our industry with good access off of Interstates, which facilitates access to our major metro centers," Stacey says. Construction will be a 13-month process. A major portion of the site development involved excavation and demolition of an abandoned mine. The distribution center will be highly automated with a conveyor system and sortation system geared toward increased productivity. The new location allows McLane drivers to cut 100 miles (62 km.) off their normal routes compared to servicing the region from the Virginia and New York facilities, Stacey says. Lackawanna County is also the site of a new 1-million-sq.-ft. (92,900-sq.-m.) Sears distribution center. Sears is leasing the facility in Covington Industrial Park from First Industrial Realty Trust. The facility employs about 200 and serves the company's stores in Pennsylvania, New York and New Jersey. Another major project in the region is a 1.4-million-sq.-ft. (13,000-sq.-m.) facility that Johnson & Johnson Sales and Logistics is leasing in Coolbaugh Township. The Port Jersey Channel deepening is part of a federal project to allow ports to handle large container ships. The facility, which opened in 2007, will eventually employ about 700. Distribution operations in northern New Jersey and metro New York will likely get a boost from the deepening of the Port Jersey Channel in Bayonne and Jersey City. Work began on the project, which will deepen the channel by 22 percent to 50 feet (15.2 m.), in late 2007. Scheduled for completion in fall 2009, the $200-million deepening is a joint project of the New Jersey Dept. 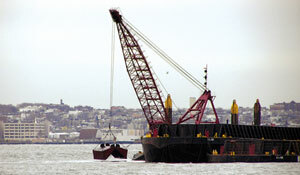 of Transportation, the Port Authority of New York and New Jersey and the U.S. Army Corps of Engineers. The project will provide an access point for the largest ships using the bi-state harbor. In addition, the project will improve safety by realigning the channel. Port commerce, particularly container traffic, has increased in New York Harbor an average of seven percent every year for the last 10 years, which creates a need for additional space for container ship berthing and container processing in the region. New Jersey's Portsfield Initiative is an ambitious plan to redevelop 17 brownfield or underutilized sites into logistics hubs. 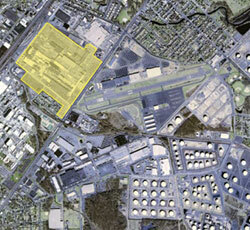 One of the first to be redeveloped is the site of a former Chevron Asphalt refinery in Perth Amboy. Morris Industrial builders has built two buildings at the site, now know as the Amboy Corporate Center. Two major tenants – U.S. Foodservice and Best Buy – plan to place distribution centers there in leased space. U.S. Foodservice, the nation's second largest food distributor, has leased 452,000 sq. ft. (42,000 sq. m.) of the center's first building. Best Buy has leased 492,000 sq. ft. (45,700 sq. m.) of the second building. "A lot of the draw for New Jersey is it's a port-related market," says Mindy Lissner, a senior vice president with CB Richard in Brunswick, N.J., who represented both companies in their leases. "The Port Authority is doing everything it can to support growth, with the expectation of imports increasing 10 percent annually over the next five to 10 years." New Jersey's distribution market is a dichotomy, says Thomas Monahan, senior vice president with Colliers Houston in New Jersey, with northern Jersey serving the metro area and central Jersey serving regional markets. Demolition equipment lined up in mid-Febrary as Duke Realty launched its redevelopment of the former GM facility in Linden, N.J. Potential uses at the site (below) – near Port Newark and the Elizabeth-Port Authority Marine Terminal – include distribution center projects. consumer product companies looking for plenty of trailer parking, he says. "Trailer parking has become a vital component to most larger industrial users and is a determining factor between stabilizing an asset or having it remain vacant," he says. "It's a very important factor when relocating or designing new product." New Jersey's regional distribution center business is changing, with buildings getting larger and larger to cover wider areas. "A majority of national industrial REITs and out-of-state developers have an appetite for New Jersey since it is the third largest industrial market in the U.S.," says Monahan. "When multiple outsiders eye the same property, the competition drives rates up and these companies could overpay for a piece of land. In order to realize a return, site coverage is then maximized, unfortunately at the sacrifice of trailer parking." Monahan notes that the Ports of Newark and Elizabeth experienced double-digit growth for several years until 2006, when growth was only 8 percent. "There is a price point where land values become so high that companies begin looking elsewhere for their regional distribution needs," he says. "They not only compare lease rates but also their drayage costs, tolls, fuel, taxes and labor." Monahan says New Jersey has been losing a lot of distribution center business to Pennsylvania due to the challenges involved in redeveloping brownfield properties, scarcity of economically developable land, long entitlements and the cost of doing business in New Jersey compared to other competing states. That migration might continue if a plan by Gov. Jon Corzine to boost highway tolls is approved. Corzine proposes to raise tolls by 50 percent in 2010, 2014, 2018 and 2022 to pay for transportation projects and reduce state debt. "That will have a major impact on industrial property in New Jersey," Monahan says.